This is particularly surprising as the disease - caused by Vitamin D deficiency linked to lack of sunlight - is more commonly associated with the urban slums of Victorian Britain than with rural, farming communities, as existed in Neolithic Scotland. The nature of the grave itself - a simple burial rather than a chambered tomb - has raised questions as to how the woman, physically deformed by the disease, may have been treated by her community. Professor Ian Armit from the University of Bradford explains: "The earliest case of rickets in Britain until now dated from the Roman period, but this discovery takes it back more than 3,000 years. There have been a few possible cases in other parts of the world that are around the same time, but none as clear cut as this. While we can't say for certain that this is the earliest case in the world, it is definitely very unusual. "Vitamin D deficiency shouldn't be a problem for anyone exposed to a rural, outdoor lifestyle, so there must have been particular circumstances that restricted this woman's access to sunlight as a child. It's most likely she either wore a costume that covered her body or constantly remained indoors, but whether this was because she held a religious role, suffered from illness or was a domestic slave, we will probably never know." The skeleton was discovered along with at least three other burials during an amateur excavation in 1912. 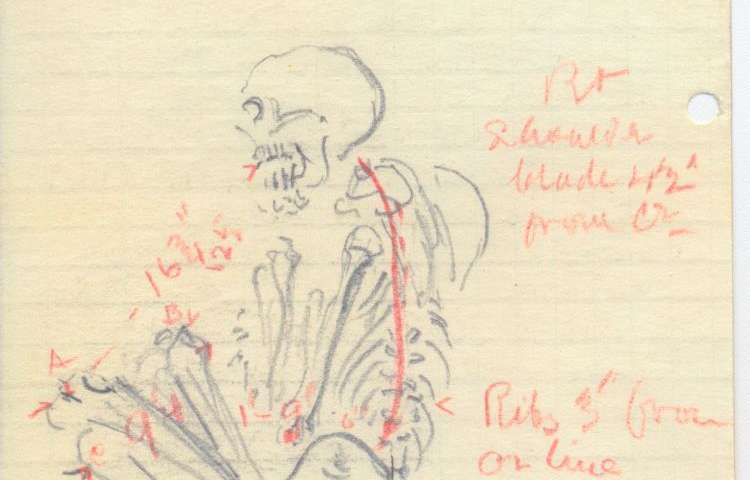 Only one of the skeletons was taken off the island, and is now part of the Hunterian collection at the University of Glasgow, although photographs of the others remain. 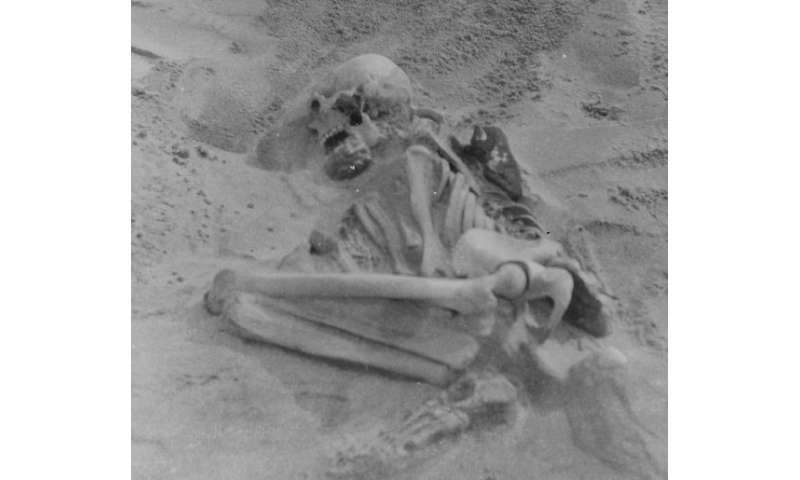 The skeleton was always assumed to date from the same period as a nearby Iron Age settlement. However, recent radiocarbon dating by a team from the Universities of Bradford and Durham showed the skeleton was actually from much earlier - between 3340 and 3090 BC - placing it firmly in the Neolithic period. The skeleton is of a woman, aged between 25-30, measuring between 4' 9" and 4'11" (145-150cm) which is short even by Neolithic standards. The bones show a number of deformities that are caused by rickets - particularly in the breastbone, ribs, and the arms and legs. These would have left the woman pigeon-chested with misshapen limbs - all characteristic of the disease. Analysis of the layers of dentine laid down in the woman's teeth during childhood enabled the team to uncover details about her life history, particularly her diet, between the ages of three and fourteen. The changing levels of carbon and nitrogen isotopes show that she appears to have suffered from physiological stress, possibly malnutrition or ill-health, between the ages of four and 14 years old. The isotopic analysis also showed that she was local to the area - levels of strontium were high, which is a key characteristic of ancient communities living on islands such as the wind-blown Hebridean islands, where crops were fertilised with seaweed and subject to salty sea-spray. The analysis also showed that she didn't eat sea fish - something that would have provided the Vitamin D in her diet to prevent her contracting rickets. Avoidance of foods from the sea was a common practice amongst farming communities in the Neolithic period, even those in coastal areas where fish and shellfish would have been plentiful. Dr Janet Montgomery from Durham University says: "Malnutrition or illness as a child, lack of sunlight growing up, deformity and disability as an adult and finally a burial without the usual rites afforded during Neolithic times, seem to be the sad life history of this woman, based on our study of original documents from the excavation and analysis of the skeleton itself. "While there are many questions left unanswered, particularly because the other skeletons from the burial site aren't available for detailed analysis and Neolithic burials are only rarely excavated elsewhere in the Hebrides, we can only speculate as to why a disease linked to urban deprivation emerged so early in a farming community. It seems especially poignant that these communities had some cultural aversion to eating fish, and yet that simple addition to her diet may have prevented the disease."